He talks a great deal about the two AI schools. One led by Marvin Minsky sees AI as replacing humans at work. The other, spearheaded by Doug Engelbart is all about augmenting human’s lives and work with digital technology. It was in that spirit that Engelbart presented the Mother of All Demos, which showed the world why we would want to use a personal computer rather than a typewriter. He did it again when he created a new navigating device called the Mouse, which caused a sensation in 1984 when it was introduced to consumers along with the first Macintosh. Markoff is one of only two people I peronally know to have won a Pulitzer Prize. A career that started in early trade publications, brought him to the NY Times where he spent most of his career. He wrote a balanced and extremely well-researched book on the history of Autonomy versus Augmentation giving an account of both schools of brilliant thought and technology development. He came down on the side of Augmentation after acknowledging that for the first time in the history of human development, transformative technology was likely to eliminate more jobs than it will create. My new book, still in the very early planning stages, will come down on the side of Augmentation. Unlike Markoff, I do not plan to provide a balanced perspective. My books tend to champion new technologies and this new book as the title should make clear, favors using AI to enhance human work, not replace the humans who do it. I will predict that the stability and perhaps the very future of humans as we are now and have been for 3.5 or so million years is threatened by the runaway advances of job-replacing technologies. Thomas Frey, a futurist has predicted two billion jobs—half of the world’s positions–would be eliminated by 2030. 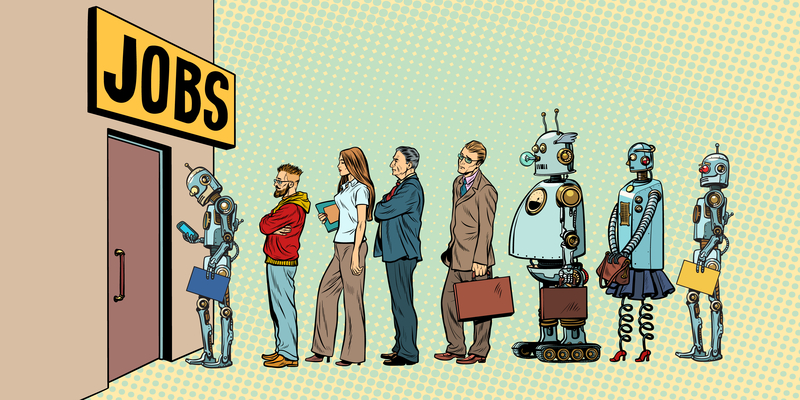 He has since identified 162 new job categories that will come into being by 2040, but it does not seem sufficient to replace what will be lost, if his forecasts are correct. In fact, McKinsey Global Institute and others speculate on such matters is that somewhere around 800 million jobs will be lost and no one yet seems to have a set figure on how many new ones will be created. However, it is a very good bet that the people qualified to do the new ones will not be the same folks who lose the old ones. Forecasting is difficult. There are always unexpected surprises and unintended consequences: It is one reason that I avoid calling myself a futurist as Frey likes to be called. I believe the future will always surprise you, so I try to just spot early trends and figure out if people are likely to want or need new technologies when they first seem to ignite adoption and enthusiasm. I also have firmly believed for a very long time, that early phase technologists tend to discount or minimize darkside factors. In the case of AI, I often notice that they are slow to discount the AI threat to work as we know it today. When I push the issue, I often discover that the AI enthusiast shares my concerns that far more jobs will be lost to AI than gained by it. They als concede that jb losses will not just be in areas involving repetitive, hazardous or unpleasant work: there are many professional and administrative positions that are in the crosshairs of being consumed by bots, robots, AI software and assorted AI autonomous or automated applications. Augmenting People will be a prescriptive book arguing that in many cases where humans can be totally replaced, they should not be replaced, such as in the case of autonomous automobiles and an idea increasingly championed by the government, insurance carriers and large segments of the automaking industry itself. A second example is in various aspects of healthcare ranging from surgery to elder care companionship. It will be several months before I write the first page of this new book, but that page will make clear that Augmenting People is a prescriptive book that champions keeping humans in. In subsequent chapters, I will document examples of how revolutions have been started by massive unemployment and hopelessly lopsided patterns of income distribution, such as Americans now face. Since 2005, when Robert Scoble and I wrote Naked Conversations, I have used social media to research and develop my books. This ItSeemstoMe blog will be one of the ways I do it, and I have already started doing it on Facebook where I am asking people for thoughts, cases and links to help me write this—the most challenging book I have written so far. I hope you will join me with your thoughts, stories and your candid correction of mistakes I post on social media so that my book will be impeccably accurate. These are all part of my rather unique way of researching and writing books. Later, I will start posting early chapter versions so that you, my readership, can comment, correct and dispute. You guys help me to write better books and I thank you for it in advance. If you already have ideas for this book please contact me at shelisrael on Facebook Messenger or email shel@shelisrael.com. I’m very much looking forward to the book, Shel. I like the title. Nice idea, will be around to help! Technology as always did, will make people’s lives better. Internet, AI, … Will bring tons of opportunities for those who want to use them. In times of change – now change rate is faster, but change always existed -, is important to keep an eye on opportunities to avoid lagging behind!